Dr. John O'Donnell was recently promoted to the rank of full 'Professor' at the University of Pittsburgh. The process which includes internal School of Nursing review, University review and review by faculty from around the United States took place over the past 6 months and culminated in his promotion on April 19, 2013 by University of Pittsburgh Provost Dr. Patricia Beeson. O'Donnell completed his BSN from Carlow College in 1983, his MSN from the University of Pittsburgh in 1991 and his Doctorate in Public Health (DrPH, epidemiology) from the University of Pittsburgh Graduate School of Public Health in 2009. His doctoral dissertation entitled "Development of an Optimal Patient Transfer Task Set and Simulation-Based Intervention to Reduce Musculoskeletal Injury in Healthcare Workers" was named the dissertation of year by the Department of Epidemiology. He was named to the 'Graduate Faculty' of the University in 2010. O'Donnell's professional career as a nurse has spanned med-surg, oncology, PACU, obstetrics, ICU care, and since 1991- nurse anesthesia. He has been the Director of the University of Pittsburgh School of Nursing Nurse Anesthesia Program since 1994. The program has been ranked as a Top 10 Graduate Nurse Anesthesia Program by US News and World Report since 1998 - one of only 3 programs nationally to be ranked in the top 10 over this period. The program has also received two consecutive 10 year accreditation reports (1999-2009, 2009-2019) without a single citation or area of weakness. 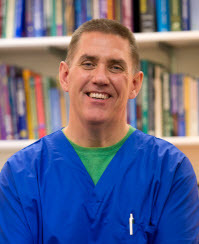 John is dedicated to the nursing and nurse anesthesia professions as well as to the University of Pittsburgh. In 2006 he was named a lifetime Distinguished Alumnus of the University of Pittsburgh School of Nursing, in 2010 was honored with a Cameos of Caring Outstanding Nursing Educator Award and in 2011 received the Chancellors Distinguished Teaching Award- the most prestigious teaching award given by the University. Additionally, he was honored as National Program Director of the Year in 2006 by the American Association of Nurse Anesthetists and has served in leadership positions on the state and national levels including state Treasurer, Finance Chair and as a Chair Reviewer for Council on Accreditation of Nurse Anesthesia Educational Programs. O'Donnell has been active in human simulation education since 1994, was named the Assistant Director of WISER in 2004 and Associate Director in 2006. Recently he was named Co-Director of Research at WISER (2012) and assisted WISER in becoming the first civilian simulation center to achieve full accreditation in all four domains (Research, Assessment, Teaching and System Integration). He is a member of the WISER Research Committee and has mentored multiple doctoral and masters student projects. He is also a co-author of the iSIM Course which is offered on an international basis and is well known as the lead author of the American Heart Association "Structured and Supported Debriefing" online program. Areas of scholarly and research interest include patient safety, provider safety, development of procedural skills using simulation, mastery education, interprofessional simulation, technology use in education and debriefing in simulation and clinical education. His interest in provider safety is consistent with his longstanding interest in patient safety. Since 2003 he has been one of only 2 CRNAs to sit on the national Anesthesia Patient Safety Foundation(APSF) Board of Directors.